When we were looking for a long term relationship with a boat we chartered over a dozen models and noted the good and bad points. 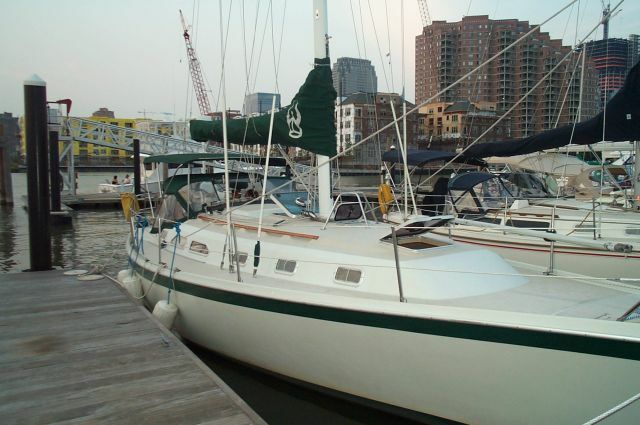 After five years of chartering we bought the first Fleetwing, a 38 ft Ericson. It was a fine boat and like a thoroughbred, it had to be treated right or it let you know. Not too tight, not too loose on the wind, just right or bad things would happen. It was also very fast with a fully battened main but also heavy to raise. After a while, it became evident to us that for several more years of cruising, a more comfortable boat ought to be considered with more conveniences (like a genset and roller furled main). - A Roller Furling Main and Jib. We longed for the convenience of just rolling up the main instead of hoisting it aloft not to mention the added safety factor of putting in a reef by just partially rolling in the main instead of going forward in who knows what seas and putting a reef in manually. We had reefed in rough seas several times with the Ericson and it was no fun. - A Sugar Scoop Aft End. Okay, someone falls into the water and you want to get him aboard with only one crew member still in the boat, how do you do that? Of course, you would throw a life ring but then what? Our Ericson had an overboard ladder that had to be deployed on the port side manually but it was still quite difficult climbing it. Of course, you don't usually fall overboard in calm seas so you could depend upon challenging conditions. We had been introduced to sugar scoop aft ends in the Caribbean on the Beneteaus we chartered there and found them very convenient for snorkeling off the back, easy off and easy on. If the waves were running, you could point into the wind to shield the swim deck for easy access. With one crew member manning the helm, the one in the water can climb onto the swim deck my himself. The 38ft Ericson was unforgiving. It was fast but you had to trim it right! Be off a little and you were punished. We wanted a boat with a more forgiving sailplan, be off a little in trim - no big deal. Maybe not the best for winning races but we didn't race anyway - we wanted a comfortable boat for long term cruising. We also didn't want a mast higher than 60 ft to be sure of getting under ICW bridges which are supposed to be a minimum of 65 ft at high tide but are often lower (64, even 63 ft!). A must for our plan on cruising down the ICW. It's possible to navigate the ICW with a 6 ft or even a 6.5 ft keel but it would not be comfortable for us. We like the leeway of a 5 ft or less keel. Also, a wing keel was out. We had one on the Ericson and if you ran aground and tried to kedge off, the wing would dig right in like another anchor. When you hit bottom on the ICW (when, not if!) you don't want the first thing to find the bottom to be the rudder!! I know of several boats that have sunk due to the rudder post cracking upon a grounding allowing water to flood the boat. Let the keel do its job without interference from the rudder. Many of the boats now have two wheels at the helm with the necessity of two sets of instruments or peering in the distance at instruments set halfway between the wheels - not for us! Well, we wanted all the comforts of home so 120v AC was a requirement. We wanted toast in the morning out of a real toaster and coffee from a drip coffee maker along with hot water and battery recharging not to mention an occasional running of the A/C for cooling or warming up. We desired the ability to cool or heat the cabin. The A/C is really a heat pump, it can go either way, we wanted one (needs a genset when at anchor). The Ericson was an exercise in frustration in working on the engine or accessing the stuffing box - impossible! We wanted something much easier to work on - especially to change filters and impellers! We wanted to option of not having to visit a supermarket every week so we wanted a large freezer for food storage. The Ericson did not have a windlass and weighing the anchor was good exercise for the back (not!) We wanted something easier, a windlass would be the answer. We would be anchoring in mud and sand with the occasional covering of grass and weeds. We needed an anchor to perform well in all those conditions along with surviving current reversals without pulling out or slipping! The title says it all but oh those discussions on the sailing forums on the best one! A good sailboat should be able to spin on it's axis without a bow thruster. This ruled out a traditional, long keel for us, a modified fin keel was in order (shoal, so it's longer than a fin keel but much shorter than a full keel). A spade rudder complements the shoal keel with the propeller directly in front of the keel for maximum maneuverability. Traveling down the ICW in the fall can result in some cold days as fronts come down from the north. A full enclosure would allow cruising in comfort and add considerably to the living space on a sailboat and would be conducive for watching sunsets in comfort with drink in hand. We planned on occasionally having friends and family on board so a second cabin with its own head is a necessity. Going down the ICW is easier if you have an autopilot for the long, straight sections. It can steer a better course than you can manually! It's especially handy when there's only two on board. Engine temperature: it's surprising how many new boats have no temperature gauge. What's the value of the temp alarm going off AFTER the engine has overheated! You want to know whether the engine is approaching the overheat point BEFORE it overheats! AIS: Automatic Identification of Ships (AIS) is a boon to the coastal cruiser. Transiting NY Harbor, it's a godsend. There are over a dozen of very large ships close to you and knowing which direction they are headed and at what speed is invaluable, especially in hazy conditions or, worse yet, in fog. Armed with all of the above "wants", we surveyed the available boats and made our choice - see the page on "Our Fleetwing"